Massage has been around for thousands of years. For almost as long as people have been giving massages, they have been using tables to support their clients. Massage tables as we know them have only been around for about 100 years, but previous eras used similar furniture to achieve the same purpose. While you probably won't find an ancient Greek massage table in the antique store in town, it's fun to know a little about the evolution of this piece of furniture. 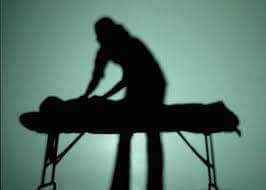 *The ancient Greeks used a version of a massage table from about 800 B.C. to about 150 B.C. These tables were made of marble or wood and were used in gymnasiums. These early massage tables were called "plinths." *The Victorians also performed massage. They used furniture-like massage tables called "couches." These couches were very heavy and were generally upholstered with leather or fine fabrics. They were usually stuffed with horsehair or sawdust. *In the early 20th century, massage tables began to look more like traditional medical exam tables. They were made of hardwoods, often oak, and featured a padded top that was usually stuffed with horsehair and upholstered with leather. Some early massage tables featured a vibrating surface. *The next generation of massage tables, used in the years following World War I, was usually made of domestic hardwood and stuffed with cotton, sawdust, or straw. The table covering was usually made of an easy-to-clean early form of plastic. *In 1930, the first portable massage table was created. These early portable tables were heavy, but they featured high quality materials and excellent workmanship. By the 1940s, lightweight, portable tables had become popular. Many of these were constructed of aluminum and plastic. *It was not until the later 1940s that massage tables began to feature cutout face holes. It took several decades before the current horseshoe-shaped face cradle came into existence. Today's portable table with a horseshoe cradle was created in the 1980s. The Massage tables we use on the go for mobile massage may be a little scuffed here and there after a few years of hauling it around town, but definitely way comfier than one made of marble, with no face-cradle... wouldn't you agree?